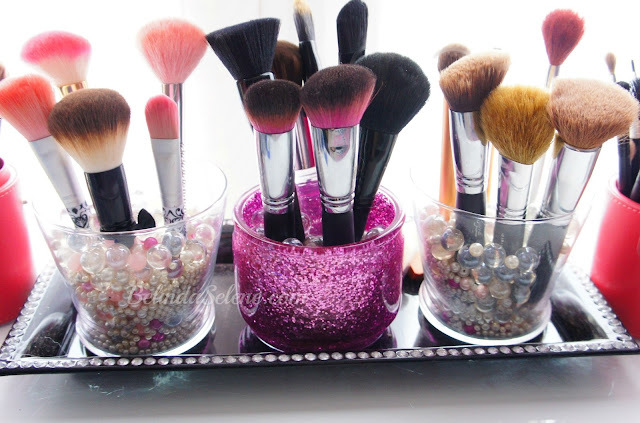 There are a lot skin problems which happen due to dirty makeup brushes and unhygienic makeup. I believe in sanitizing the makeup too. Brushes must be cleaned every week. So you have problem free skin and hygienic makeup.Well, you can buy a makeup brush cleanser, there are lot many varieties and options in market or you can do it easily at home without any extra buy. Waxy makeup doesn’t come off easily from shampoo, for that we are going to take help of coconut oil. Coconut oil is a very nice makeup remover, so it can be used to clean brushes too. Soak a cotton pad in coconut oil. Now rub the brushes on this pad till the brush becomes colorless. No matter how stubborn is the makeup, this trick never fails. After doing this step, soak all the brushes in the concoction of shampoo and water. Wait for 10 mins and wash with clean water. Ta..da.. your brushes are clean now, just like the new ones.